Last week my friend, the fabulous Lesley Cookman (author of the superb Libby Sarjeant cosy crime series), tagged me in the Next Big Thing, an online chain of author and book recommendations - so today's blog post is me, answering set questions, about - yes, you guessed it - my Next Big Thing, which just happens to be my next book - AN ENORMOUSLY ENGLISH MONSOON WEDDING - which will be out in hardback and kindle in February 2013, and paperback in May 2013. 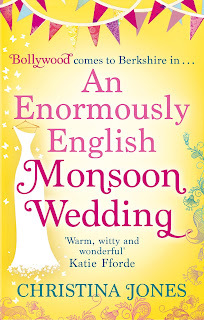 Er - oops, sorry - just said that above - AN ENORMOUSLY ENGLISH MONSOON WEDDING. I wanted to write a funny, summery, weddingy book set in a country village - but with a difference. And as I've recently been closely involved with several fusion weddings, a sort of East-Meets-West marriage of different cultures seemed like a good idea. My very own branch of Romantic Comedy - Bucolic Frolics! My books are traditionally published by the Piatkus imprint of Little,Brown. I'm kindly linked with amazingly talented rom-com authors like Jill Mansell, Carole Matthews, Milly Johnson, Jane Lovering and Katie Fforde - I'm fantastically flattered by this! My daughter's fabulous fusion wedding - which I must say, went far more smoothly than Erin and Jay's in AN ENORMOUSLY ENGLISH MONSOON WEDDING - with none of the horrors. My fictional fusion wedding is entirely fictional! The tagline for this book is "BOLLYWOOD COMES TO BERKSHIRE" - so I hope this is a hint that it's a bit mad, and colourful and noisy and lively... And it covers the six scorchingly hot summer weeks before Jay and Erin's wedding - a wedding they've planned carefully, a wedding they're absolutely sure will go exactly the way they want it to, without any hitches or problems or interference from friends and family... Poor deluded souls... Oh, and it's the first book in my new series of Bucolic Frolics. It's set in the village of Nook Green - and future books will take place in the neighbouring villages of Bluebell Common, Maizey St Michael, and Daisybank. Dear Blog - I'm very sorry that I've ignored you for so long, but you know how it is... stuff happens, some things have to take priority, other things get ignored - and yes, sorry again, but you were among the latter. I can see you've gone sniffy on me because everything's changed since we were last together. The Blogger layout for a start - and now the font and the settings - and I'm not sure that I like it. Hopefully, once we get used to one another again, it'll be okay. 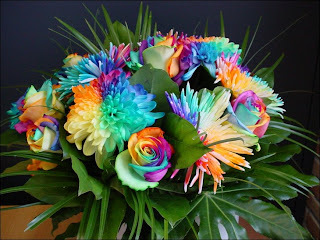 And I've given you a gorgeous bunch of flowers here by way of apology and to show that we're all happy again. We are, aren't we??? You see, Blog, you're supposed to be a happy thing. We've shared some tough times since we've been together, yes, but mainly you've been a source of light relief, something to smile over, maybe even raise a chuckle or a little giggle. And honestly, Blog, life has been a bit well, un-smiley and un-chuckly and un-giggly for ages and it seemed unfair to inflict a whole wodge of - basically - sad crap - on your shoulders. So, I ignored you. Then everyone in the family was ill - I mean mostly hospital-ill - and I should have had a season ticket to that car park! Oh - they're all fine now, thanks, but half my life seemed to be spent in various wards and departments for weeks and I wrote zilch. Then there were the deaths. Not related to the above paragraph I'm relieved to say. And no details, Blog. But three very good friends, all young, all sudden. Three funerals, three lots of consecutive heartbreak, three lots of grieving, masses and masses of tears - and no writing at all. My heart simply wasn't in it. So, when I wasn't at hospitals or funerals, I was at the vets. Lexie, with her inoperable intestinal *lump* and Emily with her epilepsy and kidney failure, were backwards and forwards on a daily basis for weeks and weeks and each visit had me in stomach-knots and floods of tears. And I found it hard to write anything at all - let alone something cheerful. Oh, yes - against all odds, both Lexie and Emily are doing well, thanks. In fact they're both in the garden in the sun (do you remember sun?) as I'm typing this, having eaten a good breakfast and look set to carry on for a good while yet - but it's been touch and go for ages... And you know me, Blog, I can never write when the cats are ill. So, the book was late. Very late. And I panicked - a lot. And worked off-line - again, no time to visit you, or answer emails or anything. And then, even when the book was done, I knew it wasn't great because I was unhappy - and there were rewrites - twice - which scared me because I began to wonder if this poor book, with so many fits and starts, would ever be a) finished and b) any good. 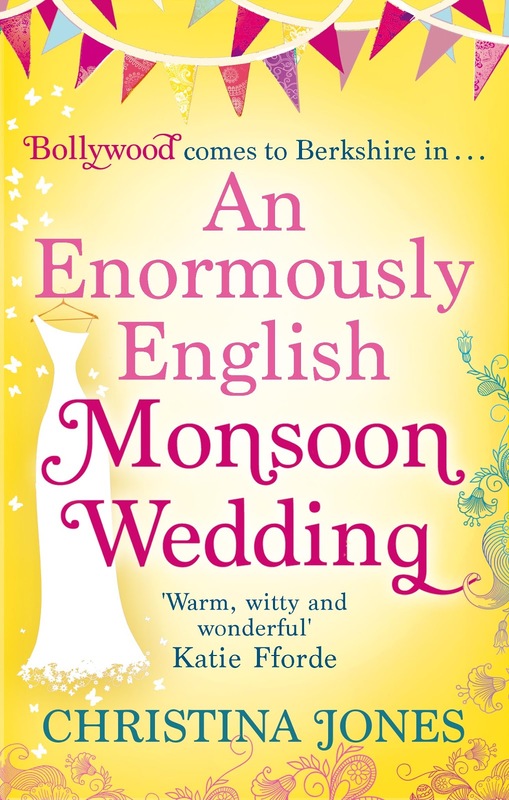 I'm very happy to say, Blog, that thanks to a lot of understanding, hard work, careful suggestions and more patience than I'd have had with me, by my lovely editors and agent, AN ENORMOUSLY ENGLISH MONSOON WEDDING has finally turned into the upbeat, romping book I'd always hoped it would be. However, and with fingers and toes tightly crossed, I'm going to say that I think things are finally getting better. I'm feeling more positive and yes, rather stupidly (?) I've just decided to write four books at the same time. Yes, I know - but I had four ideas that wouldn't leave me alone - so I'm currently writing bits of each one every day. And now the sun's shining (literally and metaphorically) and I'm smiling again. And I'm back with you. See you again soon - promise, Blog. 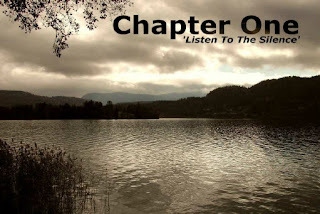 Yes, okay - it's over 3 months since I last blogged - THREE MONTHS! That's BAD! That's very, very BAD. I will start posting more regularly - promise - and there have been good reasons for the gap... oh, and I shouldn't even be blogging now because the new book has to be finished in Feb (and it will be!) so I'm deep in deadline hell, BUT I couldn't let publication day go by without a little bit of a celebration. Due to the deadline and everything else, the celebration will be pretty muted. There won't be any balloons or champagne or fireworks or bouquets - no, sadly my launch party is just me, still in my pyjamas, sitting in the back bedroom - er - study - at the desk, writing the new book while simply being ecstatically happy that NCSG has made it out there. So, the balloons and fireworks et al will be virtual, but I'm now raising a cyber glass of fizz to Never Can Say Goodbye! Happy Publication Day! So, I've only one thing to say after my crash and burn experience - Back Up! I'm sure everyone else in the world religiously backs up their work on a daily/hourly basis - but I hadn't. I blame being the delirium of being a new Nanna. (Elle, Topaz and The Doctor are doing amazingly now - I'm still a bit shell-shocked). So, when the kiddies at PC World shook their heads over my old computer I knew I was in trouble... They've managed to retrieve a lot of stuff from the old hard drive but I'm still gnawing my knuckles in shame at things I've lost... So, please, please, please - don't think like I did - oh, it'll be okay - because it might just not be... I'm now backing up like a thing demented. In the brilliant Peter Robinson's brilliant new novel, Before The Poison, which I was reading in bed, I'm mentioned on page 315!!!! 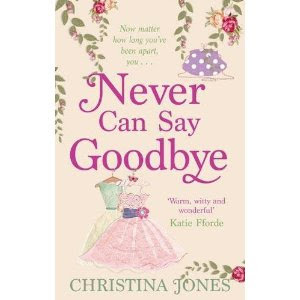 His heroine, Heather, has just settled into her new flat and has spent an evening eating pizza, watching trashy telly and reading a book for the first time in years - "a Christina Jones - a real guilty pleasure..."!!!! Oh, well, wow! and thank you Peter - especially as you're mega-famous and currently have a series on telly and all. I was so over-excited at the mention that I dropped the book, yelled a lot, scared the cats and woke up The Toyboy Trucker who wasn't best pleased or even the teeniest bit impressed. As for me - well, I'm preening and showing-off in my usual diva fashion and am telling anyone who'll listen that now I'm not just a New Nanna - I'm also A Guilty Pleasure!!!!!!!!!!!!!!!!!!!!!! On Tuesday 9th August 2011 at 3.56 a.m. I became a grandmother! Yes, very early - and not without its dramas - but it's all over now and Mum and Baby are doing fine. Nanna (as I've elected to be called - as in Peter Pan) is still in shock. Poor Elle, after a lousy pregnancy and several weeks in hospital with pre-eclampsia, became too ill to carry on so they decided to induce the baby last Sunday. After a 36 hour labour (don't ask - none of us ate or slept and God alone knows how Elle coped without shouting or screaming once, bless her - brave wasn't in it!) our granddaughter made her appearance. She was popped straight into an incubator and rushed off to SCBU where she was first in intensive care, then high dependency, then rallied nicely and eventually rejoined her exhausted mum and happy dad two days later on the ward. I won't go into all the gory details but I can assure you that this will be our only grandchild! Anyway, she and Elle were discharged from hospital and finally came home last night - which is why I haven't posted before. They've both been given the all clear and are now happily reunited with The Doctor, and of course, our granddaughter is the cutest, tiniest, most gorgeous and perfect thing in the whole world - even though she shouldn't be here for quite a while yet. Her name? Well she has two and they're beautiful: one British and one Indian to mark her dual heritage - but to protect her anonymity, for blog purposes, I shall call her Topaz because that's what I've been calling the bump since Easter when I was convinced it was a girl. So now The Toyboy Trucker is a besotted Grumpy (Elle's choice!) - and a whiz at nappy changing and bottle feeding - and I'm just besotted and elated and really, really thankful it's all over. Welcome to the world, Topaz - I'm your Nanna!!!!!!!!!!! The End Of An Era - Or New Beginnings? So, this morning it was no more corporate suit-shirt-tie and briefcase-and-laptop and multiple mobiles! Hooray! This morning he started off on his new venture - working with his best mate on a cross-country delivery business of their very own. This morning he left here in jeans, polo shirt and boots.... He's a Toyboy Trucker again - and I'm more delighted than you'll ever know. And this morning, after he'd left the house looking once again like the boy I fell in love with, I typed Chapter One of the new book of the new deal. It's still unoriginally called Book One because I'm still without a title, but I've written four pages already (it's 8.20 a.m.) and it's going okay... I will probably find it very hard to remember not to add a dollop of magic in this book - this is very much the end of an era for me too - but it's quite exciting to be starting something completely new. Well! Unless you unleashed me in a chocolate factory with a spoon I couldn't have asked for more! 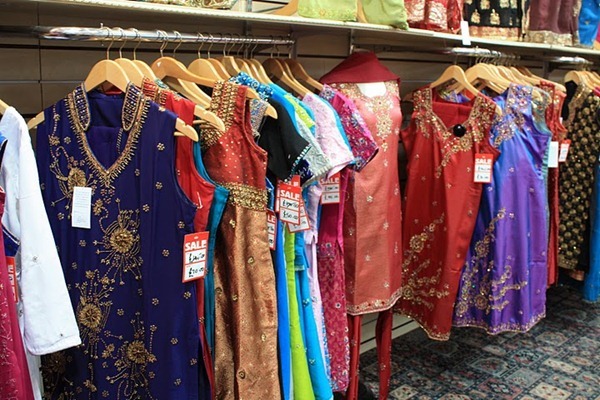 We (me, The Toyboy Trucker, Elle and The Doctor) went to Southall Broadway to shop for wedding clothes... And I was entranced, bedazzled, completely overcome with dizzy excitement. So many fabulous shops. All those rainbow colours... All that glitter and sparkle and twinkle... Total, absolute bliss. So, we went to Southall to buy something stunning and authentic - and I absolutely adored it!!!! It's vibrant, jam-packed, lively - and looks and smells and sounds as if you've just stepped into a Bollywood movie. 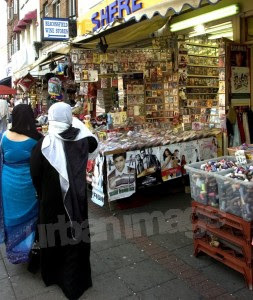 There's no "death of the High Street" in Southall, I can tell you. And oh, what bliss to be served by people who actually cared. Who were interested in what we bought and why we were buying it. Who said - and proved - that nothing was too much trouble. I settled on a salwar suit in purple and gold... I'm now convinced that I shall live in salwar suits for the rest of my life. Why have I never discovered them before???? So comfortable, so elegant, so flattering, so pretty - they're light and drifty to wear, hide a multitude of sins, and made me feel like a - well, no not a princess (too old, too fat) - maybe a sort of Bhangra Queen Mother???? By the time Elle and I had ooohed and aaahed our way up and down the Broadway, and eventually made up our minds, and then dived in and out of a zillion jewellery shops for the necessary matching multiple bangles and ear-rings, The Toyboy Trucker and The Doctor had become a bit bored with all the glitz and glam and girlie shrieks of glee, and wandered off to Jalebi Junction, one of the most famous food stalls Southall has to offer. 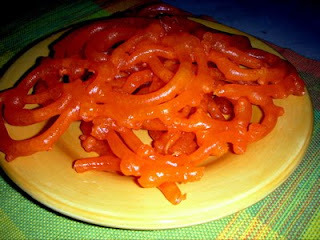 Jalebis are sticky, glorious, made-on-the-spot sweets. Spirals of fresh dough are piped into boiling oil and fried while you wait and watch. The dough takes on the characteristic orange colour in the deep frying process and is then dunked into another container of sugar syrup. The jalebis are then cooled on a wire rack until they can be popped into a brown paper bag and handed to you with the warning that they're very, very hot. Yes they are, but I defy anyone not to eat them while they're very, very hot. Even though you can't speak and get covered in syrup and look pretty disgusting... They're the most delicious things I've ever tasted - well, apart from the Gulab Jamons of course (the nearest thing to Rum Babas - and heaven - I've ever found).